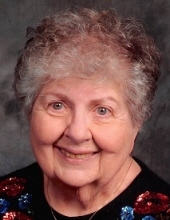 Anne C. Rossman (nee Calabrese) age 85 of Wickliffe, passed away March 31, 2019 at Hospice House in Cleveland. She was born Nov. 5, 1933 in West Aliquippa, PA. Anne was a longtime member of Our Lady of Mt. Carmel Church in Wickliffe. Anne is the beloved wife of the late Richard A.; dear mother of Theodore (Cindy), Therese, Todd (Tami) and Thomas (Cindy) Rossman; grandmother of Matthew, Stephanie and Kevin Rossman; Gavin, Alexandra and Jordan Mrofchak; Sara and Dana Rossman; Andrew and Emerson Rossman; daughter of the late Antonio and Philomena Calabrese; sister of Lucy Best and the late Connie Albanese, Joseph Calabrese, Nicki Herrick and Mary Rodgers; aunt and great aunt of many. Burial will be in All Souls Cemetery in Chardon Twp., Ohio. The family will receive friends Friday from 4-8 PM at Brickman Bros. Funeral Home, 37433 Euclid Ave., Willoughby. In lieu of flowers, contributions to Karen P. Nakon Breast Cancer Foundation, 35765 Chester Rd., Avon, Ohio 44011 would be appreciated. "Email Address" would like to share the life celebration of ANNE C. ROSSMAN. Click on the "link" to go to share a favorite memory or leave a condolence message for the family.